You can find the full article here (only available in French). 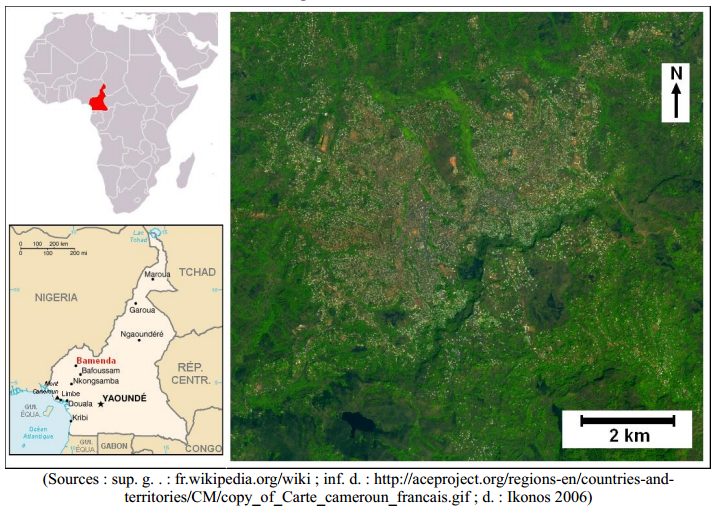 The story all began as a Cameroonian student, which was finishing his Master degree in social ecology at the VUB (Vrije Universiteit Brussel), contacted my future Thesis Advisor at ULg for getting help in his own memory thesis. The topic of his work was about the impact of natural disasters on the social life of the inhabitants of his hometown Bamenda in Cameroon. This town, as we will see it later, is strongly affected by natural risks such as floods and landslides, and these often cause population to move to safer places. He already collected the spatial and non-spatial data and my job was to conceive a GIS-prototype for him to study the risks and the impacts in his town. Bamenda is a town located in the Nord-West of Cameroon. The city is characterized by a steep cliff cutting the town roughly in two city-parts: Up-station and Down-Station. The natural disasters mostly occur near the cliff and these are landslides and floods which affects the population mostly living in Down-Station. Our goal in this thesis was to conceive and to implement a GIS prototype for studying the impacts in the risky areas due to the floods and landslides. Basically, we will provide a tool which will help to depict areas where human and material losses are most in case of a disaster. An orthophoto of the area is also provided. All these data had to be “cleaned” and corrected for both the geometries and the attributes in order to respect the Data Quality Norm ISO 19110. Many of them have been dropped as they were not useful and other data had to be completed via spatial process, joints, etc. All the details can be found in our work. It is composed of a server running 24/7 at the ULg and which already hosts several server applications. Details of the machines were not provided as we will implement a light infrastructure (see below), we do not need large requirements. 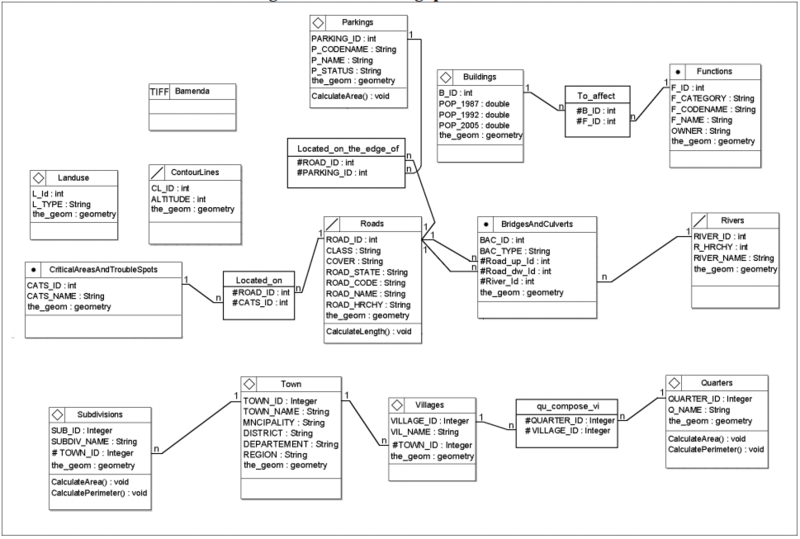 As we are working under the constraints of minimizing the costs, we chose the free rdbms PostgreSQL/PostGIS. The cleaned Shapefiles have been imported into a database and will be exploited as tables. At this stage, we made the final data validation by executing a bunch of sql requests. This is about counting the number of features, checking the topology of the data, etc. The now database stored data have been made accessible to the outside of the ULg’s intranet, and applications, such as uDig and Qgis (remember cost minimization), can consume these data for analysis. We went a step further by exporting these data into kml and by visualizing these in Google Earth. This was one of the best representations of the data in order to identify, for example, the buildings standing in flooding area. 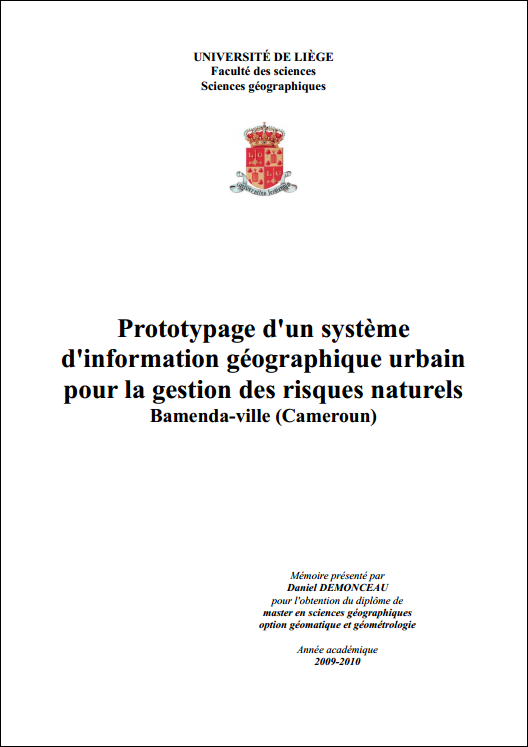 With the available data and under the constraint of cost minimization, we were able to create a GIS-prototype which allowed to depict risky areas in the town of Bamenda in Cameroon. This work was done back in 2010 but with my knowledge now and the now available technologies, the works could have been enhanced tremendously! First, an application server can be inserted between the database software layer and the desktop application. This can enhance the capabilities of the whole application stack and makes it possible to access the data via other interface other than just the one database one. Adding, for example, a server such as MapServer, can add an OGC layer on top of it make the data available through WMS, WCS and WFS interfaces. 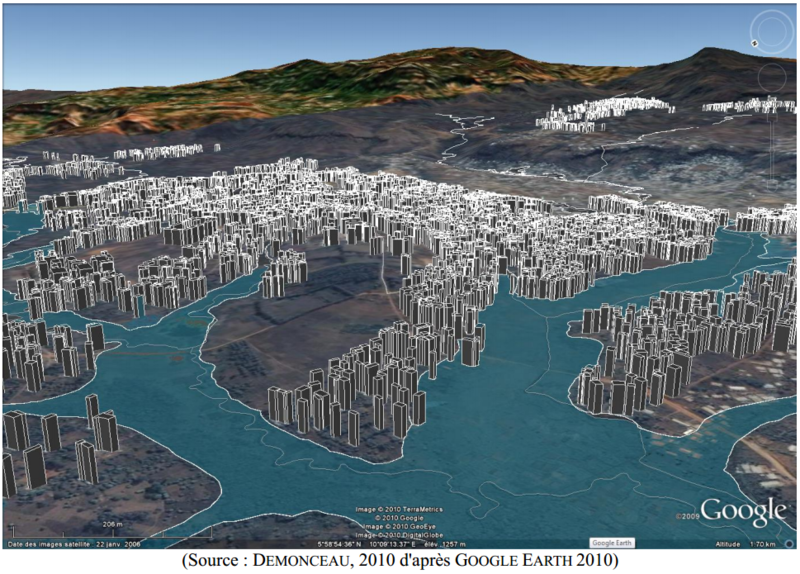 As this work was only a prototype showing the basic capabilities of the product stack for the available data for Bamenda, Cameroon, it would be interesting to study the possibilities for other cities building such a system. This article is so good to read. Great!! Thank you for sharing, I would like to post it on my blog to share with my families? Dear Daniel Demonceau your work is so nice no doubt you have done great job. i am also doing M.S for this i needed your help, i am waiting for your fruitful reply. Thanks a lot Sikandar! Feel free to contact me in private if you have questions! Great article. I’ll have to use Google to translate your thesis — thanks for sharing!